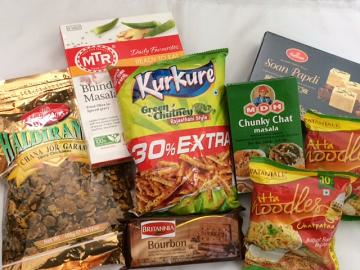 Your favorite Indian snacks in a gift pack. An assortment of carefully selected Indian food and snacks that you are sure to cherish. 1 pack of MDH or Shaan masala. Want to be surprised or give a surprise to someone special every month? Subscribe to this subscription food box for 6 months to get all new taste of authentic Indian food flavors every month. Get Your favorite Indian foods delivered to your door every month! **Save $15 when you subscribe for 6 months food box. You only pay $164.99 for 6 months subscription. An ideal gift on any occasion like Mother's day, Father's Day, Valentine Day, Diwali, Birthday or just to celebrate a special moment. This item in Gourmet Indian Food category was first added to our catalog on 06-28-2017. Buy Indian Food & Snacks Gift Box - Taste of India Subscription Pack, sold & shipped by Yaadein where you can shop online for Pooja Samagri, Hindu Statues, Puja Items, Religious Gifts & Home Decor. This Gourmet Food collection has been tagged as diwali birthday valentine fathers mothers day gift box, indian food, indian grocery, gourmet gift basket, spicy snack.